The QuickDraw Tactical Overhead Gun Rack is especially designed to transport tactical-styled firearms in Jeep Wranglers. The QD857-OGR-JEEP expands out from 42 to 48 inches and locks in place to the Wrangler's side roll bars with Great Day's patented "opposing force" installation system. 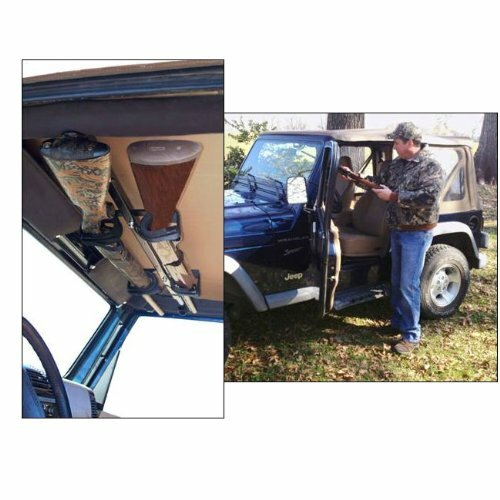 The QD857T-OGR-JEEP can be installed or removed in an amazing two minutes! No drilling, no bolts or screws required. This QuickDraw Gun Rack is designed specifically to accommodate the unusual shape of tactical weapons. The weapons are positioned snuggly against the truck's headliner in cushioned, moldable cradles. Instant access to the weapons is as easy as pulling two Velcro tabs. The QD857T-OGR-JEEP is constructed of super-strong aircraft and comes with a lifetime warranty against defects in workmanship or materials. Weighs only 6 lbs.